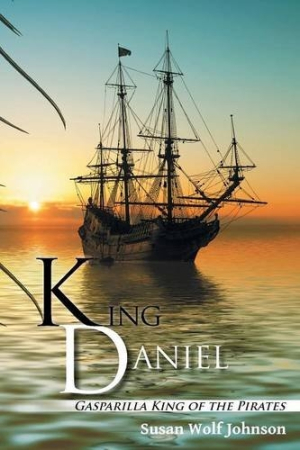 Nautical twists abound as King Daniel excites with its page-turning thrills and familial revelations. Against a colorful backdrop of pirates, family secrets, and intrigue, Susan Wolf Johnson’s King Daniel shines as a literary lighthouse on rocky shores. When Daniel Westcott, the newly chosen Gasparilla King of Tampa Bay, Florida, goes missing in 1973, the remaining Westcotts are thrown into chaos. Natalie, Daniel’s wife and the matriarch of the household, struggles to maintain appearances amidst the mystery. She is supported by her granddaughter, Becca, a wandering soul who had escaped to New York to pursue a singing career on Broadway, only to be drawn back into the strange hierarchical world of Gasparilla pirate krewes. Though it seems Daniel may have been “kingnapped” by local drug smugglers, the truth may be more complex than anyone realizes. Becca gradually uncovers her family’s secret, sordid history, leading to revelations that will forever impact her and the other members of the Westcott family. Beautifully crafted, the novel maintains some shred of mystery almost until the final chapters. Subtle clues are scattered throughout to allow a piecing together of the true nature of the Westcott family’s history along with Becca. There is no central protagonist here. Rather, the family itself occupies that role, with outsiders serving in supporting roles throughout. Victor, while one of these outsiders, is especially developed and serves to anchor Becca’s—and by extension, the rest of the Westcotts’—tendencies toward flightiness. Though Becca and the rest of the family must wrestle with loss in various ways—loss of innocence, loss of life, loss of self—there is a strong thread of redemption that runs underneath the tragedy and elevates the narrative out of potentially pure cynicism. The prose is effortless and strikes a balance between the solid, evocative details of sea life, pirate festivals, and drug smugglers, and the ephemeral inner worlds of its characters, especially of the mentally unstable Julia, Becca’s mother. The few chapters devoted specifically to her point of view are delightfully disorienting and breathe with a tinge of mysticism. Enough historical markers, such as mentions of the Vietnam War and Nixon, are present to situate the audience in the time period. Hints of religious themes are sprinkled alongside brief touches on recently legalized abortion in New York, but these issues are distantly secondary on this smaller stage. The turmoil of the outer world serves as a macrocosm of the family history’s seemingly never-ending list of half-truths and outright lies to preserve their all-important reputation.